Lately, my needles have been working non-stop. I've got a lot of things either in process or recently finished. 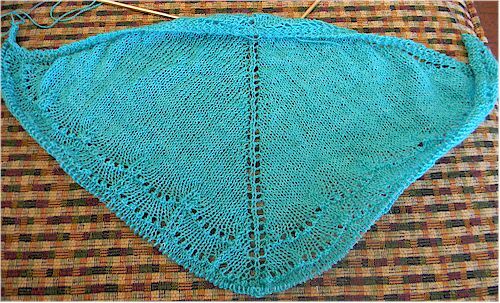 Currently I'm working on my Charms OWL at Hogwarts (see HPKCHC group on Ravelry), as well as my Dozen Shawls in 20Dozen KAL (group also on Ravelry) with this project - the Aeolian Shawl by Elizabeth Freeman. This pattern is available for FREE over at Knitty.com in the Spring '09 issue. 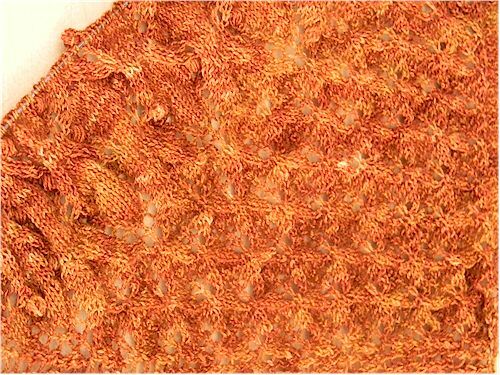 I'm working this out of Madelinetosh Tosh Lace in the Saffron colorway - 950 yards of orange, gold, copper, rust and 100% superwash merino beauty! I fell in love with this yarn several months ago and bought a skein with no real plan - I only knew that it was for me and had to be made into something special and beautiful. When my wedding anniversary came around in December and I bought a new black dress for our dinner celebration, I found myself yearning for this in a shawl as it would have been a spectacular accessory. Early this month I cast-on and look forward to wearing it well before our next anniversary, if not also then. This is the first pattern I've ever worked that featured nupps - a new technique for me. Nupps are essentially bobbles in lace and need to be worked very loosely. For this pattern, I'm working 7-stitch nupps. 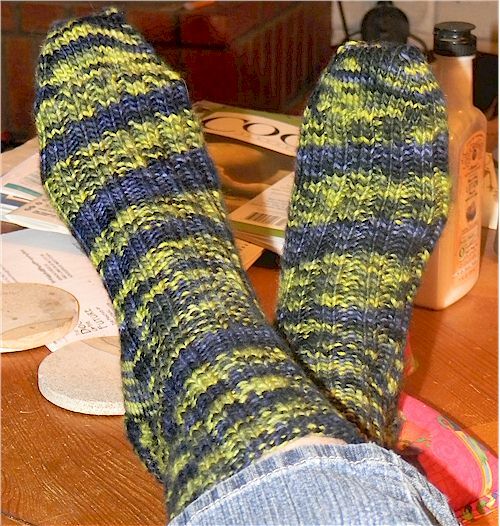 I'm also working on a pair of bed socks for John, having just completed a pair for myself. 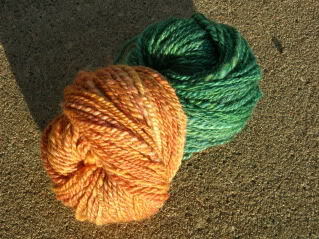 For these I'm using Malabrigo Worsted. His are being worked in Ravelry Red. I worked my pair in Lime Blue This yarn is incredibly soft, smooth and down-right yummy. No, it is not the ideal yarn for socks... it does pill, and I am making socks out of a worsted weight yarn, but these are for sleeping in, and do not get any more wear than kicking in the night will cause. Being 100% pure merino wool, they are delightfully warm. Since completing mine I've actually seen a significant improvement in the quality of my sleep (amazing what warm feet will do) as well as a significant increase in my desire to stay in bed in the morning relishing their warmth. I particularly loved how the striping lined up in these without even trying. Friday concluded my most recent session of the Skill Sampler Hat class I teach at Village Wools here in Albuquerque. 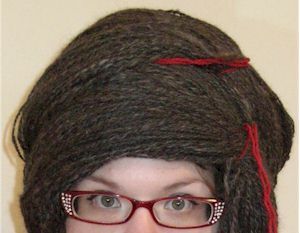 I re-knit whatever item I teach with ever session, and therefore I have yet another (5!) of my Gracie hats. 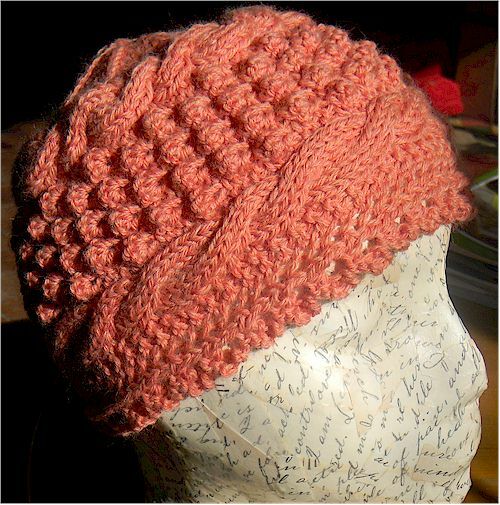 This time I chose Cascade 220 Heathers in Nectarine. It's a brighter color than I've worked this pattern in before and I really like it. I really enjoy working with this yarn. You get a lot of "bang for your buck" with 220 yards of 100% Pure Wool for an affordable $9-11. This hat pattern works up in 140-170 yards (depending on embellishment), well within the 220 yards Cascade provides. This yarn blocks well, and I've not had a problem with splitting. My students almost always have favorable things to say about it in class. 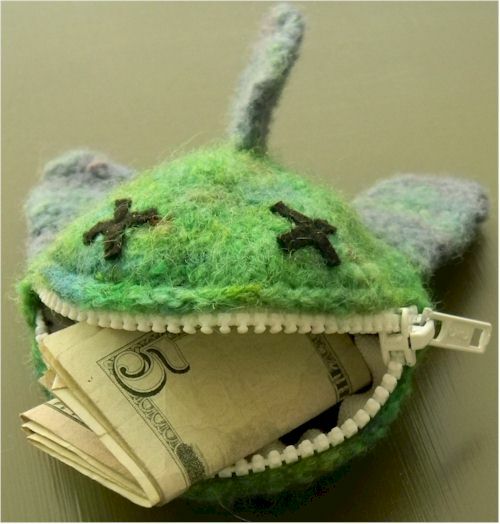 Also on the completed works list is this adorable change purse - Coin Pocket - Monster Fish by Daniela Nii, available on Ravelry for just $4.00 US. I simply couldn't resist. This was a quick project, that I was able to knit and felt in one day. To be fair, I modified the eyes from the instructions... somehow a fish out of water for that long seems more natural dead to me - I have an odd sense of humor, I know. This was my first hand-felting project… I’ve always just thrown it in the washer before, which I learned gave me a whole lot more control over the felting process, however I will be needing to pick up some good rubber gloves before I do this again as it was a rather harsh process for my hands. Sewing the zipper in was a bit clumsy at first - place it, pin it, UNZIP it and then sew. I ended up ripping it out once just because I wasn’t thrilled with the placement. Next time I’ll baste it in place first. (Lesson learned!) It also occurred to me that sewing in hook and loop tape, you could make this a cat toy with a catnip pouch inside and when it gets frayed, simply remove the catnip pouch and toss in the washing machine to re-felt. 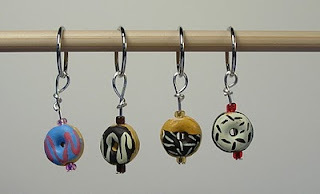 I’m thinking a whole lot of people and fuzzy friends will be getting these for Christmas. I have two more awaiting fins. For this project I used two of my own Kool-Aid dyed yarns. 100% wool (duh, felting!) and I loved the effect the color changes had once felted. 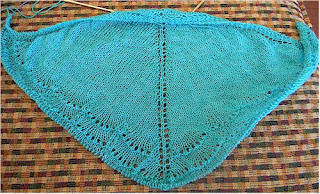 Also on the needles, lest I be without something to do, is the Holden Shawlette by Mindy Wilkes available for FREE on Ravelry, which I'm working from Twilight Luxury Wool in Teal Sparkle by SoftnShiny (keep your eye out for a Dyer Moments Interview with her in the near future!) I've got 870 yards of this gorgeous dark teal (picture color is quite off, sorry) that features 75% superwash merino, 20% silk and the sweetest little 5% bit of silver stellina which adds a nice accent. 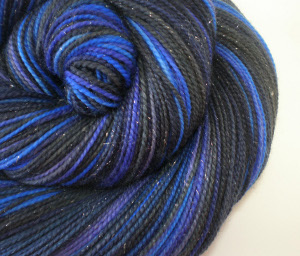 Normally, I don't go for sparkly yarn - glitter just isn't my thing, but this one is delicate enough that you have to look twice to be sure of what you saw. I have modified Mindy's pattern slightly, to work less of a stockinette field. As I've blogged before, I do not like being a stockinette-zombie, I prefer the action and challenge that you can only get whilst running from zombies. (Shout out here to both Ray and John, brothers both in blood and spirit who have action plans in place for the inevitable Zombie Apocalypse - I love your kind of crazy!) Therefore, I did a little math and am working the wave charts earlier, as well as many more of them - the original pattern calls for just 450 yards. My finished shawl will be larger and slightly lacier than the original, but will feature all of Mindy's design aesthetics in heart. This project also counts toward my Dozen Shawls in 20Dozen KAL, effectively as number 3. Wow! I'm starting to realize, I knit a lot. My first clue should have been that weird dream I had in the early hours shortly before the alarm where I was walking down the street seeing stitch patterns appearing in the asphalt beneath me. And of course, this isn't all that I'm working on. There are a couple projects in hibernation (always!) including another shawl and a hat. There is one new pattern design in the swatching department. And there will forever be projects in my queue. What are you working on? What amazing project do you suggest I add to my queue? Let me know! Oh yeah, and no, I wasn't paid or asked to review any of the patterns I linked to above (not that I am or would be opposed to such - hint, hint!). I link to what I love to share great things with you! I have a dear friend who is struggling right now. Not to go into too much detail, she is withdrawing from some prescription medications under Dr. supervision and dealing with the associated side-effects of doing so, all the while dealing with some other deeply personal relationship issues. Bless her, she has a LOT on her plate right now. Wisely, she is seeking solace in knitting. 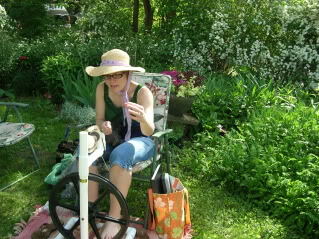 She is a very accomplished knitter, spinner, dyer, so I was shocked when she asked me to tutor her on a couple projects. I was happy to do so, but honestly very confused as to how I was going to be able to help her, knowing her skill set vs. mine. When the opportunity finally arose, I met with her, and we reviewed her proposed projects. She'd chosen projects that were both beautiful and not necessarily difficult (although one pattern was in desperate need of a tech editor, but I digress.) Then I saw the disconnect. Prescription medications can have really serious side-effects that aren't necessarily measurable or tangible. They can affect comprehension and memory. They can affect patience, endurance and muscle memory. They can give you the shakes and disturb your ability to judge grip and tension. They can torture a skilled knitter. I don't believe she is alone in these experiences. In fact, it got me to thinking about older knitters, and knitters of other impairments. I often encounter knitters in these categories in my knitting classes. I've worked with autistic, attention deficit, and short-term memory impaired knitters, all who kindly and wisely made me aware of their specialized learning considerations so that I could best assist them. 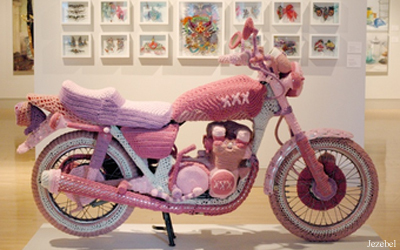 I've worked with knitters that were returning to knitting from years of absence. 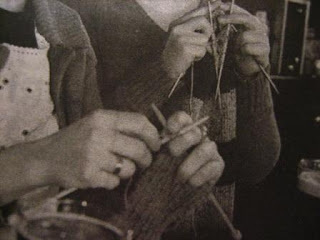 The greatest constant that I've worked with is frustrated knitters - regardless of whether it was because they remembered being good at it, or simply understood the concept but couldn't make the sticks and string agree. My heart goes out to the frustrated. I fear frustration in my years to come be it from some physical or mental impairment. But from fear, I will not be paralyzed. Instead, I pay it forward and meet it with Peace, Love and Understanding. 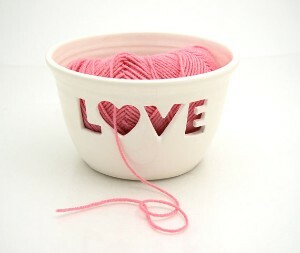 For Valentine's Day this year, I'd like to encourage everyone to help another knitter face one of their frustrations. Blatantly offer, tell them this is your chosen goal if you wish, sit, spend time and provide them with Peace, Love and Understanding, and if in the end it just isn't getting there, hug each other and celebrate what is accomplished, remembered and the time you spent working together. In the end, that means so much more than what you did with a bit of string and a couple sticks. Join me today in getting to know Melissa Ricks! 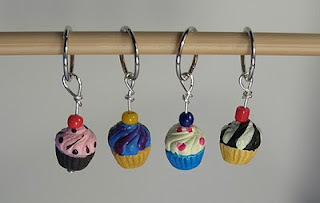 ~Aside from childhood attempts to crush berries and color doll clothes, my first dyeing experience was in high school. 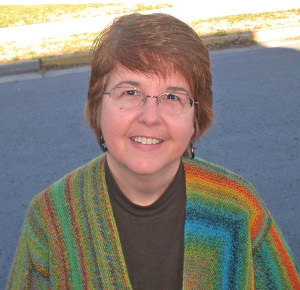 I had just knitted my first sweater - a vivid hot pink wool raglan pullover. When I realized that the color wasn't the best for me, I fearlessly decided to dye it. I used gold dye from the supermarket and my hot pink sweater became a lovely warm brick red - perfect! I guess I just have always looked at things with an eye to what they could become, not just what they are, so it seemed the natural thing to do. ~The dream of having a fiber and yarn business of some type began in childhood, but it wasn't until 2008 that I got up the courage to pursue the dream. 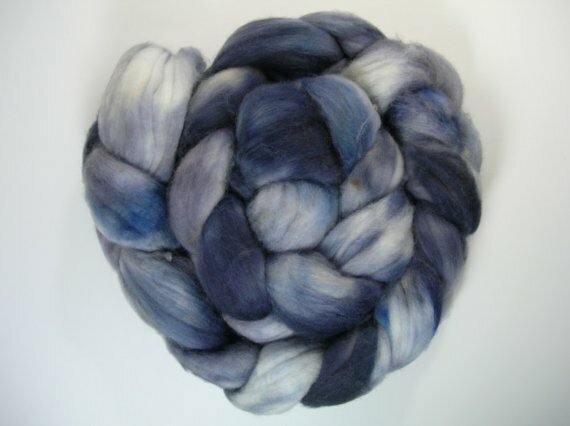 I started by selling handspun yarn on etsy.com as a sideline to support my knitting and spinning Other spinners admired the fibers I dyed for my own handspun, so I began to also sell hand dyed fibers. 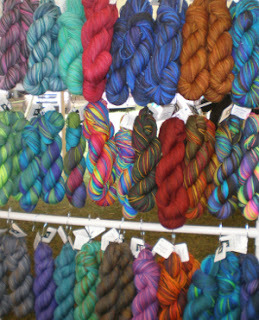 Then, once I began selling at fiber festivals, knitters who didn't spin saw my colors and asked for hand dyed yarn. Within a year and a half, my 'sideline' business became my full time occupation. The name, 'Wild Hare Fiber Studio' came about when I was gathering my courage to start a fiber business, and comes from an old southern saying: if someone does something unexpected and daring, people say they 'go off on a wild hare.' I was working as a Realtor, dreaming of yarn and spinning wheels and one day decided to 'go off on a wild hare' and pursue my dream. ~Generally, my colors are inspired by the beauty of the natural world, but I love to play with how colors interact with one another, so some of my colorways are spontaneous and some are based on color theory. I have some colorways that I repeat and keep in stock, but each season I do a batch of new ones -- a few may be added to the repeatables, but many of them are just for a season. While I don't copy from it, I do keep an eye on the Pantone 'color forecast' to make sure I have some of the colors that will be appearing in ready-to-wear that season so that my yarns will work with other garments. Most of the time, the colorway tells me what to name it. ~Oh yes. My great-grandmother taught me to crochet when I was a preschooler, I taught myself to knit from a book in junior high. I added spinning in 1990, and recently discovered that sock yarns work really well on a rigid heddle loom! 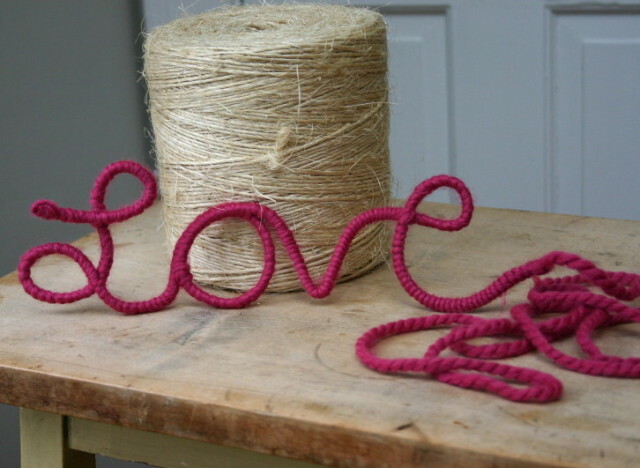 There's always something new to learn or try in fiber arts! ~Colors are like children -- no fair playing favorites! Different colors play different roles, and sometimes an 'ugly' color is just what is needed to make another color really shine. 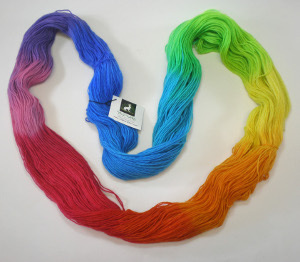 When dyeing my yarns and fibers, I intentionally create a range of colors in each yarn or fiber to appeal to a variety of people. Sometimes a color that I would never choose for myself can become a best seller! 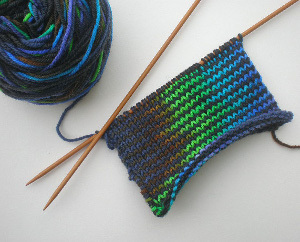 In my own knitting bag, you're most likely to find teals and greens, purple, coppery browns and neutrals. 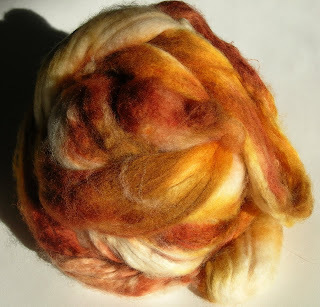 ~Probably superwash merino wool, because it dyes so vividly and well. ~After a childhood spent drawing, painting, sewing and doing anything creative I could find to do, I attended Duke University and double-majored in Political Science and Fine Art/Design. After graduation I worked for the university in marketing and communications. When I married and began having children, I became a homeschooling mother who did a variety of other things on the side, such a creating t-shirts featuring my artwork, selling clothing for nursing mothers on ebay, and 'flipping' houses. When my marriage ended, I became a Realtor, something I chose both because I really enjoyed helping buyers and sellers through the process of finding or selling a house, and because it offered the flexibility I needed as a single mom with small children. Having a fiber business draws upon the sense of color and design that I developed in college as well as skills in marketing and sales that came through my work experience -- and I can design my own schedule so that my families needs still take priority. In order to keep the house focused on family and have enough space to meet the demands of my business, I now rent a studio so that I have a dedicated dye kitchen, carding station, and a room where I can package and display my products and hold classes. It's next door to the elementary school that my children attend and within walking distance of home -- perfect for my current family and business needs. ~I really just want to play with yarn and fiber, which I'm already doing, but if I could combine this with working in another country as a missionary or Peace Corps volunteer, that would be cool. ~I wouldn't want to be a professional wrestler, circus clown, or The President of the United States. My head is sufficiently in the clouds so that I would probably make a pretty bad waitress too.